This week brings us a rather strange combination of texts. The Torah reading is named for a sufferer of a disease called tzaraas. The Haftorah reading comes from the prophet Malachi predicting the arrival of Elijah, in observance of this “Great Sabbath,” Shabat haGadol which precedes Passover. Totally unrelated subjects, to be sure. This Torah portion is a follow-up to last week’s, since both discuss the tzaraas disease, a cause of ritual contamination. In effect, last week’s portion dealt with diagnosing and isolating those who are infected, while this week’s reading is concerned more with curing them. The details are confusing, alien to modern minds. The sufferer sees symptoms, lesions on the skin, unnatural growth of hair, etc., and has to call in a cohen,a priest to identify the illness. Those who are diagnosed with tzaraas get quarantined outside the camp. After a given period of isolation – generally a week – the cohenre-examines the patient, confirms recovery, supervises cleanup and shaving of all the hair, and helps the patient offer sacrifices to express gratitude for recovery. Does that make the ancient cohena medicine man? Not really. Many editions of the Bible translate tzaraas as leprosy, certainly a dread disease throughout human history. Other authorities disagree. Citing the rabbinic comment about the word metzora, the name of this week’s reading, they identify the source of infection as more spiritual than physical. Metzora combines two words: motzi –to bring out – and ra –evil, indicating that circulating evil reports about other people can produce a plague. Loshon hora – badmouthing – is the cause, therefore, of physical suffering. We might conclude that quarantine cures the disease by removing evil speech from the camp. The mystery expands, however. Not only human beings get tzaraas, their houses can get it too. So can their clothes. Dark red or green lesions in the cloth are described, and if they spread, the garment must be burned. Similar symptoms are described in the walls of a house, requiring that the bad sections of it be dumped in an impure area outside the camp, while new stone or lumber is brought in to replace them. What is going on here? Mold? Dry rot? Does the cohen become a rebuilder? Did the coat or the wall spread malicious gossip? Possibly, this whole subject needs to be taken out of the physical realm. Granted, our ancestors very likely experienced different kinds of contamination that they had to deal with. And the Torah provided them with methods of removing the contamination from their bodies and their possessions. That was then. The Midrash states that tzaraas no longer exists. Today we have other cures for skin diseases, other remedies for mold and dry rot. What we still need, and don’t always have, is the remedy for Loshon hora, the evil tongue. And that definitely still exists. As for example, take political campaigns. Now we can look forward to Malachi’s prophecy, and dramatize it at our Seder table next week: One lucky youngster will open the front door to receive Elijah the prophet. And Elijah will “turn the hearts of parents to their children and the hearts of children to their parents,” and we will guard that full goblet of wine to welcome Elijah, treasuring the hope that this year at last Elijah will announce the Messiah’s arrival! Thoughts and prayers for Shabat haGadol. 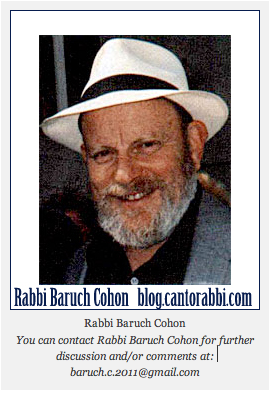 This entry was posted in Jewish Blogs and tagged badmouthing, Cantorabbi, cohen, Curing Out Ills, Hertz commentary, Jewish Blog, Jewish Blogs, Jewish Perspective, Jewish Traditions, leprosy, Loshon hora, Malachi, malicious gossip, metzora, quarentine, Rabbi Baruch Cohon, removing contamination, Shabat hagadol, slander, Torah, Torah Blogs, Torah interpretation, Torah Law, Torah Study, tzaraas. Bookmark the permalink.